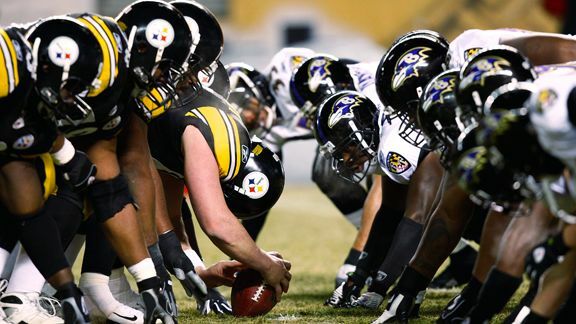 The Steelers vs Ravens rivalry has been one of the best in the NFL over the past years. While both teams are not where they want to be right now, this should be a hard hitting, down to the wire, defensive battle that all Pittsburg and Baltimore fans are used to. The Steelers and Ravens seem to have similar problems and strengths. Both teams have good defenses who can rush the passer. The Steelers have a better secondary while the Ravens front 7 is slightly favored over the Steelers. Both teams obvious problem: the offensive line. The Steelers lost Pouncey for the year and have struggled mightily in his absence. They are last in the league in rushing averaging only 61 yards a game. Levon Bell is back from injury, but the rushing attack for the Steelers has been pathetic. The Ravens are not much better at 27th in NFL with 72.7 yards a game. Eugene Monroe, the former Jacksonville first round pick filled in for Bryant McKinnie last week and whiffed on a block that lead to a Flacco fumble that was returned for a TD right before the end of halftime. Not a good start buddy. Both teams have very good defenses. The Ravens shut down the run well, but can struggle vs the pass. The Steelers can be run on, but have a top 5 NFL secondary in terms of passing yards per game. The Ravens have been trying all year to establish the run, and this could be the week. Eugene Monroe is a good run blocker and if Ed Dickson can block the tough OLBs on the Steelers, there could be some holes for Ray Rice and Bernard Pierce. Knowing how this rivalry goes, I’m going to guess the Ravens and Steelers running games are both shut down and eventually abandoned by the middle of the 3rd quarter. This means Big Ben vs the inconsistant Ravens secondary and Flacco vs the tough and experienced Steelers secondary. The Ravens will need to pressure Big Ben and close the pocket. He is one of the shiftiest pocket passers in the NFL(science messed up on that one), and the Ravens need to utilize the 3-4 to mix up blitz packages. The Steelers will put Ike Taylor on Torrey Smith and play ball. This should be a bit worrisome for Ravens fans. The Steelers generally leave Ike Taylor on an island and let Troy Polamalu run wild, which means he will be in the middle of the field distributing crossing routes, running into the flat to get under curls, and blitzing like a mad man. With the Steelers at home, and the match ups being somehow favorable for the Steelers, I think this could be another L for the Ravens. If your looking to bet on the game, I’d go with the under. This will be a low scoring game, likely ending on a field goal or a missed 4th down conversion. Pick: 17-14 Steelers. I don’t have much confidence in either teams right now. Antonio Brown and Emmanuel Sanders stretching the field scares me. If the Ravens pass rush can get 5-6 sacks and the the offense can rush for 100 yards, I would chalk it down as a win, but I don’t see that happening. This entry was tagged Antonio Brown, Ben Rothlesberger, Eugene Monroe, Joe Flacco, NFL, NFL Week 7, Ravens, Ravens at Steelers, Ravens vs Steelers, Steelers. Bookmark the permalink. ← Wizards return to Baltimore for 40th anniversary of move to DC, Melo back home.